A perioperative and regenerative pain therapies medical practice. Press Release (ePRNews.com) - SEATTLE - Jul 07, 2017 - Acute Pain Therapies is an exciting new medical practice specializing in pain control around the time of surgery and regenerative medicine for chronic pain in the region of the major joints. Founded by Zachary Fisk, MD, MBA, he and his team will celebrate the grand opening of the practice with a Bellevue Chamber of Commerce ribbon-cutting ceremony to be held on Wednesday, 7/12 from 2pm-4pm at the practice located at 1310 116th Avenue, NE, Suite A, Bellevue, WA 98004. 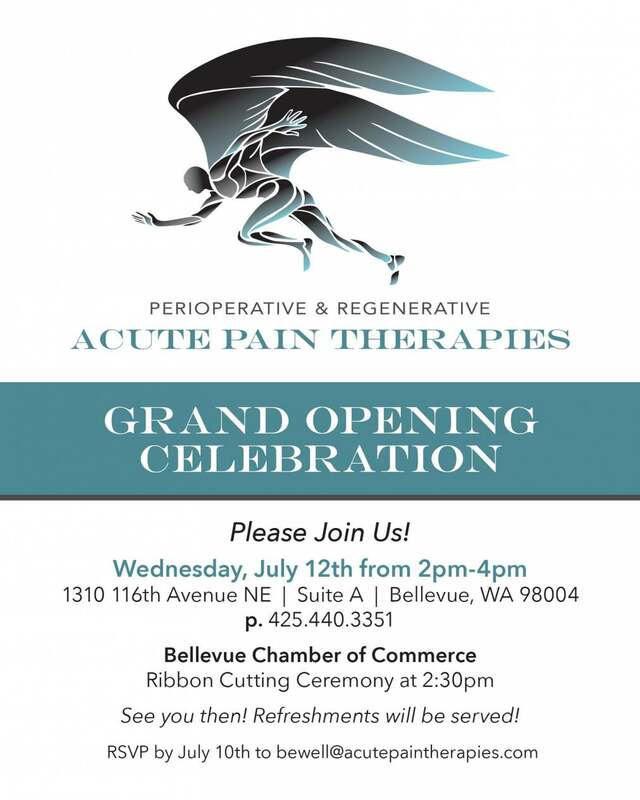 The media and public are invited to join the Acute Pain Therapies staff and the Bellevue Chamber of Commerce for the grand opening celebration. For media tours, or interviews please contact J. Carro, 480.495.8924 c.
Acute Pain Management, PLLC – Dr. Fisk began his medical career at the VA Puget Sound Healthcare System, serving as an anesthesiologist to veterans in Seattle. There he founded and served as the director of the Division of Acute Pain and Regional Anesthesia. Among his accomplishments there: standardizing nerve blocks and catheters for surgical patients, making ketamine infusions protocols that enabled this medication to become available to all patients for post-operative pain control, and teaching doctors and other staff members at the VA how to manage post-operative pain more effectively. Born in Santa Monica, CA, Dr. Fisk currently lives in Issaquah, WA with his wife Ani and young son Jonah. He is an accomplished martial artist with several black belts and currently studies Brazilian Jiu Jitsu. He’s also a classically-trained pianist. His native language is English but he also able to converse in Spanish, French, and to a lesser extent, Japanese. The practice and rounds at Overlake Hospital (http://www.overlakehospital.org/doctor/zachary-r-fisk-md) keep him busy, but when he does have a little down-time, his favorite way to spend it is by taking a long, peaceful walk with his wife Ani, his son Jonah, and Yuki, their Cavalier King Charles Spaniel.